Have you always wanted a personal shopper, but didn't have the money for your own assistant? BeeSavy is your digital shopping assistant — that pays YOU for the privilege of serving you! BeeSavy scours the internet to ensure that you get the lowest prices on the products you want at the stores YOU love. Are you a coupon clipper? Let BeeSavy do the work for you. They'll do the legwork and find any applicable coupons to lower your price even further. Want an even sweeter deal? They'll pay you cash back on your purchases! What could be better than getting paid to shop? Getting paid when other people shop! Tell your friends about BeeSavy, and they'll pay you commission on all of their purchases . . . FOREVER! BeeSavy will even provide you with the tools to make getting the buzz out easy. How would you like to earn real money forever, just by helping others save with BeeSavy? 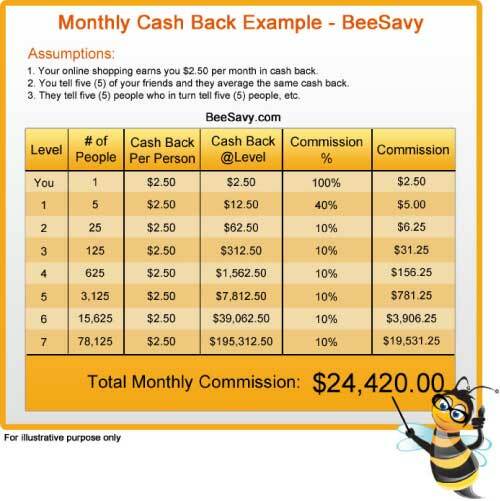 They pay you an amazing 40% commission on all of the cash back earned by people you refer to BeeSavy for life! To further show their appreciation, they pay you 10% commission on ALL of the people that they refer, down through seven (7) levels deep! Let's walk through an example. To keep things simple, let's make a few assumptions. Assumption #2: You tell five (5) of your friends, and they each average $2.50 per month in cash back. Again, this could equate to less than $25 per month in shopping, depending on store. Assumption #3: Each of these people tells five (5) people and they tell five (5) people, etc., down through seven (7) levels. Each of these people also earns $2.50 per month in cash back through their personal spending. Looking at the figure above, you will earn $2.50 in cash back from your own spending. The five (5) people you referred will earn a total of $12.50 in cash back (5 people times $2.50). You will earn a 40% commission on this $12.50 or $5.00. Now let's look at the people they refer. These five (5) people will refer a total of 25 people (5 people with 5 referrals each). This equals 25 people, each earning $2.50 from their own shopping, or a total of $62.50. 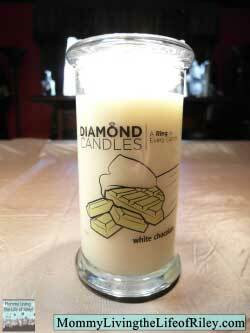 You earn a 10% commission on this $62.50 or $6.25. If we continue this through the five (5) people that they refer, etc. through seven (7) levels, your monthly cash back adds up to an amazing $24,420! BeeSavy is one phenomenal way to both save money and earn money while you shop...and even better, while OTHERS shop! Join BeeSavy today and then enter to win an amazing Kindle Fire below! Disclosure: I received no compensation whatsoever for helping to host this giveaway from BeeSavy. REMEMBER ALL CONTEST ENTRIES GO INTO THE RAFFLECOPTER PROGRAM, NOT THE COMMENTS SECTION. I HAVE COMMENTS TURNED OFF HERE SO AS NOT TO CONFUSE ANYONE.